I think we will see more of these circuits soon – runs for weeks, and can be “reloaded” in seconds. I guess measuring the current usage vs power capacity of capacitors was too easy so he decided to do it the hard way. That’s a crapload of capacitance. At work they used 5F supercaps instead of coin cells for backup power. No wonder this thing is still going. looking for 3000F so it can run 12 years ? 1 Farad is 1 amp-second. That isn’t a whole lot of power really the average AA battery is around 1000 mAh. 3,600,000 times more than a 1 Farad capacitor. Rail guns often use ni-cads and various other battery chemistry variants in place of capacitors. When you need a bunch of current right NOW, big caps just don’t have the right discharge curves. Nothing compares with flash-over in a big steel cage after something goes wrong – KaPOW! Your math is wrong. If one farad is one amp-second, a 1000mah battery is 60*60=3600 times that capacity (at the same voltage). That’s a lot of capacitance there buddy! 50 years ago, my high school science teacher was told that a 1F capacitor would have to be the size of a football field! Of course, that’s surface area, which you can clearly still cram into something small. But its a funny quote considering how common these super and ultracapacitors have become! Still, 20F is a lot by pretty much anyone’s standards. I wonder if he is using the power down mode and a wake up timer, or if he is just using a delay routine. specifically, 20F at 2.7V will store 20 x 2.7^2 = 145.8 coulombs. a 1000 mAh battery will store 1000 x10^-3 x 3600 = 3600 coulombs, or 25 times as much. @cgmark: I lack any kind of measuring device to measure current accurately down to fractions of microamps, and there are more variables than that: the current consumption is very spiky (the controller runs in 32Hz bursts, so what are you actually measuring on an amp meter? ), and theres the self-discharge of the caps, and how low the controller can *really* run below the rated 1.8V, etc etc. So I decided that just running it would give a more meaningful result than a single current measurement. 20F is a whole lot. Pretty much anything MOS should run forever on that. maybe its just me , but lately the quantity of posts is high, but its stuff like jamming a hub in a mouse. Personally I wouldnt call that a hack . But the idea had potential no less to become a hack . To be a hack I would say you need to add functionality to a device , not add more devices. This is one of my favorite sites to page threw, Just some constructive criticism. How long does it take for the super-cap to self discharge? the problem with just running it without measuring current and voltage during the process is all that it tells you is what that exact code and circuit will do. It doesn’t tell you how that will apply to other circuits powered by the same capacitors. Unless you know what it is consuming at the various times there is nothing to use for comparison. For measuring something that powers on and off you take a period of time for the measurement and multiply it. Measure what it uses for 1,5,10 seconds and use that to figure out the usage for longer periods. 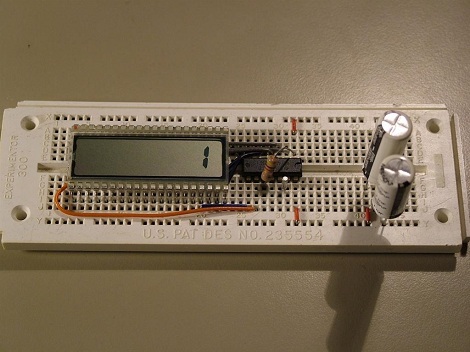 If you don’t have meters that can measure down to microamps then you can use an opamp to make a current to voltage converter. They can measure into the picoamps range before it gets difficult. Just an opamp and a few resistors. They do store a lot of energy when it comes to caps; a 5v 10F cap stores 125joules. I thought this was pretty cool and can be turned into something useful quite easily. There sure are a lot of grumpy people reading this website. If you don’t like it then don’t comment. He should have compared different microcontrollers. That would have been fun! i put rechargeable AAs in a wireless mouse to replace the dead disposables in it. Can i has artical? These guys have pretty big caps. At 10.9kJ those are indeed big capacitors! Also, all you people are forgetting super caps are very leaky; typically around 5mA. You need to factor that in your time estimates. Still think its comical so much testing and todoo over this when its not even the best out there. I would be curious to see one of our math wizards do a comparison between the TI chips here and a Microchip XLP. Obviously Im referring to doing the math for both not waiting 3 weeks for the answers. I suppose the point of this is to benchmark the incredibly well priced launchpad. But still if people are awed by the results it is worth noting that low power is one of Microchips (many) strong points. So any math wizards wanna break it down? ok so it wont let me post the link directly to microchips comparison chart comparing PIC24 and MSP430. Goto microchip dot com , under applications and markets click on XLP . I’d love to see the same thing done with an ATMega328 and compare! Actually, I think that specsmanship on power consumption of thing has gotten so complex that running the exact target application on real hardware, for a capacitor charged to a known point, is about the only way to really tell how things are going to work out. C values of far less than 20F are likely to be more useful, though! TI have just announced a new MSP430 which will run all the way down to 0.9V. I bet that would have more of an effect on the result here than sleep mode current. At 0.9V VCC, you are going to be badly effected by EMI. I think if someone sneezes close to your product it will fall over. If a Vref could be found it would have been fun to use the ADC to show the current supply voltage. Also, IIRC, there’s a way to modify the clock cycle to reduce the effect of EMI. Forgot where I saw it though. This is pretty amazing, but a rock doesn’t use much power either. I would think a real test would be to actually have it doing something a little more complex than incrementing a register, like running a multifaceted benchmark program, and monitor a heartbeat pulse. Then you start getting an idea of instructions per watt. Use something like the old “self-winding watch” mechanisms to generate current, and you’ve a great portable device. Rallen, I would not trust this kind of technology with a critical function like heartbeat monitoring. However for something like a home automation sensor / actuator which simply turns an IO pin on or off once every so often I feel this is a good simulation. Microchip blows the rest of the industry away as far as low-power micros are concerned. They are the best. That and a clock divided by 4 lol. And a lot os spit glue logic all over the pic. (i_sleep * %_sleeping) + (current_wake * %_awake) = i_total. Unfortunately the current draw is a function of Vcc in CMOS tech, so it varies a bit with the current level of the caps and stuff, but it should be close enough for a first order approximation. The MSP430s are fairly power efficient if you use the low power modes as Ken did, and with 20F backing it, I wouldn’t be surprised it runs for a very very long time. Hell, I bet the caps are self-discharging more current than the MSP430+LCD is drawing. deep sleep mode is useless, it wont save ram, registers etc. pic can be woken up just by external interrupt – in fact it is reset and start from scratch. In TI’s micros you can go down in sleep mode but you can woke it up by software side (counter), the same (by functionality) mode in PIC’s is taking more power. The Microchip youtube demo video is a scam, it shows conditions newer existing in real life!!. Ωsmoker_dave: Don’t see why the rail voltage should have any bearing on susceptibility to interference. Care to clarify that? @Torque i am working on a way to reuse these panels for active camouflage.. only problem is the number required. also another useful trick i came up with is reducing the external clock below 32 kHz, it seems that all that is required is a simple “equivalent crystal” composed of resistors inductors and capacitors with a resonant frequency in the low audio range (say 1kHz) as the current draw scales linearly with reducing frequency. right now ti is more efficient than micro but epson’s soon to be released chip will have some serious benefits such as rfid, io, and charge consumption.